Bundle included: 1. IdentaMaster® Biometric Software (1 license) 2. SecuGen Hamster Plus-HSDU03P USB fingerprint scanner. SOLUTION 2. All you need is to install IdentaMaster application, plug-in your device and enroll. DEVICE: SecuGen's popular and versatile fingerprint reader, with Auto-OnTM and Smart CaptureTM. Featuring a comfortable, ergonomic design, Hamster Pro is built with the industry's most rugged and advanced optical sensor using patented SEIR fingerprint biometric technology. 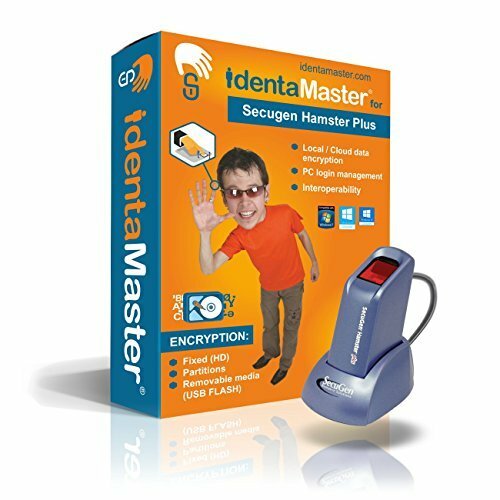 IdentaMaster comes pre-loaded with a plug-in that is compatible with SecuGen Hamster Plus-HSDU03P. COMPATIBILITY: works on PC only with Windows 7 (both 32-bit and 64-bit) / Windows 8 / Windows 10 (local administrative rights required. Not supported on domain). FEATURES: in addition to user login management, the software provides the option of encrypting files stored on a computer desktop and securing data in the cloud. The innovative system is designed to make sure that biometric encrypted data cannot be stolen by outside parties while being shared, synchronized or sent via publicly accessible cloud services (Dropbox, Silversky, GoogleDrive, etc). IdentaMaster able to work simultaneously with several types of biometric technologies and biometric scanners such fingerprint, finger/vein, palm, iris, voice, etc). If you have any questions about this product by IdentaZone, contact us by completing and submitting the form below. If you are looking for a specif part number, please include it with your message.